Shakujyu chiryo is a popular acupuncture methodology in Japan that is increasingly taught in the academic schools and colleges. "Shaku" is a concept that refers to fullness or repletion, and "jyu" is a concept that refers to emptiness or vacuity. 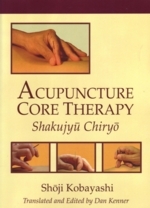 Kobayashi choses the name "Acupuncture Core Therapy" for the English language name of his shakuju chiryo method. "Core" refers to the innermost essence of something. Both the concept and the methodology of the system of Acupuncture Core Therapy combine three fundamental elements of the body's vital energy system: the hara, which is the abdominal center of physiological vital force; the spinal energy system, which is the original source of our being and our link with other realms of consciousness; and qi gong, which is the development of the body's ability to intentionally store, concentrate, and distribute vital force. Kobayashi has refined the essence of this technique from his study of classical teachings on the vital energy system and has developed a unique method of acupuncture root treatment. Using the flexibility of yin-yang, the five phases, the eight principles, and other basic tenets of acupuncture, Kobayashi applies these to clinical situations. He has reassembled the fragments of transmitted teachings and condensed them to their intrinsic core significance. Acupuncture Core Therapy is a reliable and significant methodology for achieving remarkable clinical results using these classical patterns and directing the body's energy with the intention of the needle and the choice of point selection.